Sushma Badoni has done BA and MA in Hindi from MKP College, Dehradun. 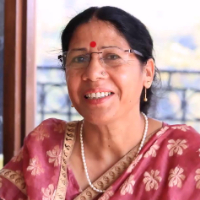 She started teaching at a school in Pauri, Garhwal before shifting to a school in Dehradun. She is a teacher at Government Girls Junior High School, Mehuwala, Dehradun. A teacher is a person who helps others to acquire knowledge, competences or values. When deciding what teaching method to use, teachers consider student's background knowledge, environment, and their learning goals as well as standardized curriculum as determined by the relevant authority. "I have done BA and MA in Hindi from MKP College, Dehradun. I started teaching at a school in Pauri, Garhwal before shifting to a school in Dehradun. I am a teacher at Government Girls Junior High School, Mehuwala, Dehradun."